Indian Palak Paneer is a much loved and extremely popular spinach curry dish with soft paneer cheese. This is an amazing way to enjoy spinach. It is spicy goodness that we enjoyed with garlic naan bread and rice. This dish can be made with just about any type of green and it is then called sang paneer. It takes a bit of work, but totally worth the effort. Enjoy it! rinse the palak or spinach leaves very well in running water. tender stem are fine, otherwise cut them off. boil 3 cups water in a pan, add ¼ tsp salt to the hot water and stir. then add the palak leaves in the hot water. close with a lid and let the palak leaves sit in the water for 2-3 mins. immediately add the palak or spinach leaves in a pan or bowl containing ice cold water. this method helps in preserving the green color of the spinach. just add 8 to 10 ice cubes to 3 cups water to get cold water. allow the spinach leaves to be in the cold water for a minute or two. then drain the ice cold water. add the spinach in a blender or grinder jar with chopped ginger, garlic and green chilies. make a smooth palak puree. no need to add water while making the puree. keep the spinach puree aside. heat oil or ghee or butter in a pan or kadai. if using butter, melt it a low flame making sure that the butter does not brown. add the cumin and let them splutter. then add the tej patta or bay leaf. add the finely chopped onions. saute till the onions become golden. then add the finely chopped garlic. saute till the raw aroma of garlic goes away. no need to brown the garlic. add the chopped tomatoes. stir and saute the tomatoes till they soften. once the tomatoes are softened and you see fat releasing from the sides of the mixture. then add the turmeric powder, red chili powder and asafoetida/hing. then add the palak puree. add about ⅓ to ½ cup water or as required. stir again. simmer for 6-7 minutes or more till the palak or spinach is cooked. season with salt. the sauce will also thicken by now. stir and serve the palak paneer hot with some naan and/or rice. 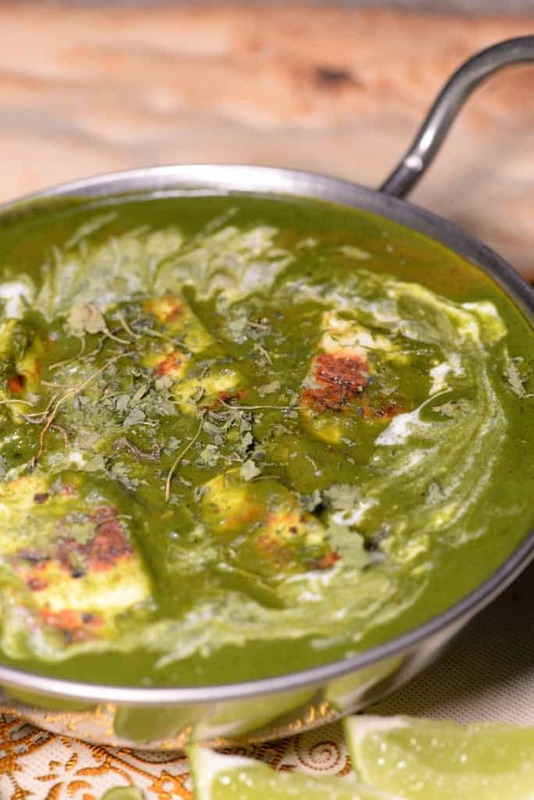 you can top the palak paneer with some butter or cream also while serving. also drizzle a few drops of lime or lemon juice on top along with ginger julienne.